Malfunctioning Nuvar Scarecrow: [Talk] Please pick a number between one and zero. [Tiramisu68] Tira M'Le'Yeritath: [Talk] that's not between, silly. [thetamlyone] Jasmine Brightmoon: [Talk] Um.....that's not between one and zero. Jayem Dareau: [Talk] She has him well trained. Like a bouncy puppy she can direct his energy, if not control it. 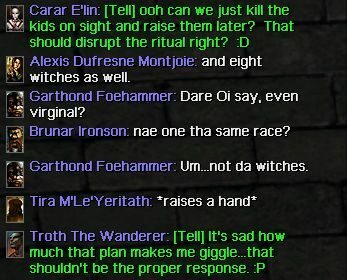 File this under "There's a first time for everything..."
From Terror's event where children were kidnapped and going to be sacrificed in a ritual...rather amusing considering what happened. In retrospect that plan was also oddly prophetic.